First introduced at the Frankfurt Motor Show in September this year, advance sales of the Mk6 Volkswagen Polo GTI has now begun in Germany, with the range-topping variant being priced at 23,950 euros (RM115,623). Under the bonnet is a 2.0 litre TSI engine, which replaces the outgoing car’s 1.8 litre TSI, rated at 200 PS and 320 Nm. Paired with a six-speed DSG dual-clutch gearbox, the five-door hot hatch will do the 0-100 km/h sprint in just 6.7 seconds, and hit a top speed of 237 km/h. A six-speed manual version will be offered at a later date. A bunch of GTI parts help mark out the hot Polo from a regular one, including a new front bumper with honeycomb elements, a red stripe that extends from the grille into the optional LED headlights, large rear spoiler and dual tail pipes. You’ll also find 18-inch wheels (an option) with red brake calipers as well as GTI badging. Inside, the Polo GTI comes with Clark tartan seats, a sports steering wheel with red contrast stitching, black rooflining and a GTI gear knob. Optional extras include the Active Info Display, driver assistance systems, adjustable sports running gear, panoramic sliding sunroof and a 300-watt Beats sound system. 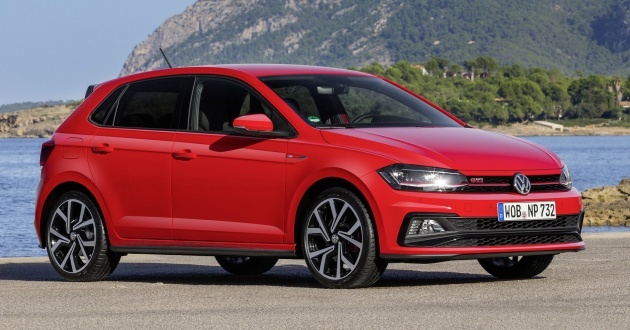 The sixth-generation Polo has already been awarded a five-star safety rating by the European New Car Assessment Programme (Euro NCAP), applicable to all variants of the supermini, including the GTI. Back in 2008, vw cud hv been Proton Iriz GTI. VW even small b-segment is solid built, capable to handle 2.0T torque. not like c-segment Civic little 1.5T even installed a rear steel bar across rear seat but still body rolling, deswai Civic needed full car modify version if want to handle 2.0T torque. Logic never works with bashers lah, abang. Iriz GTi? Jgn buat lawak la..
For those complaining about the VW Dry DSGs, not all the 7 speeder’s are the same as the previous units that were giving problems. Many of them are of the reliable wet clutch types. Dude. Why suddenly commenting on DSG? Let me correct. The dry DSG is absolutely reliable, it has been and always have been reliable since 2014 models. Move on and no need to be paranoid. If your car is manufactured in 2014 and onwards, rest assure you have a completely reliable transmission. Just enjoy the ride. Nothing ever comes close to the excitement of driving a DSG from Volkswagen.There is no one complaining about it, only you. VW took over the ailing Bentley, Bugatti, Lamborghini, Seat and Skoda and made them profitable. Why should Proton protest if they can be more relevant? Becoz P1 dunwan kena Dieselgate & DSGgate virus? Most VW cars sold in MY are petrol engine. Did P1 sell diesel engine car !? As for DSG gear, can use VW 6 speed automatic or not? The only VW using 6spd auto is low spec vento/polo sedan. Even polo standard uses DSG. And P1 did sell diesel wiras b4. To john, now U know why P1 stop selling diesel engine cars. He he he. Agreed. Lamborghini and Bentley were in really bad shape in the early 90s. If VW did not take over, both these companies would have gone bankrupt. This was the time the entire British car industry was dying. Rolls Royce was making losses. Rover was collapsing and Mini was almost dead. It was bout this time the worst performing Lotus was taken over by Proton. The previous Polo Gti was 1.4TSI. The 1.8 was in the one before that. The Mk5 Polo GTI facelift had a 1.8 TSI engine, but it never came here.